This dish is perfect for those over sized zucchinis being harvested around Ontario right now. You can also omit the beef and add portabello and cheese for a vegitarian option. To keep it high protein pack in the cheese and you can even add an egg to hold it all together once it has been cut. Cut zucchini in half and hull out seeds and put aside. Brown meat, onion and garlic. Add paste, cheese and rice, mix well. Spoon meat and rice mixture into middle of both halves of the zuchinni where seeds were. Fit zucchini back together and use toothpicks to hold zucchini together. 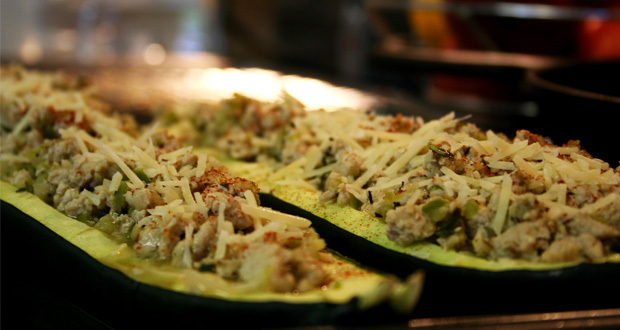 Wrap stuffed zucchini in tin foil and place on a cookie sheet in a preheated 350 deg oven or on grill for 45 minutes or until zucchini is soft when poked with a fork. Once done remove from oven/grill and slice into thick portions. Serve hot.